The film executes a one-act movement in 90 perfectly paced minutes of compact event design that wastes nothing—every word, gesture and detail tells its truth. The inciting incident occurs within the first minutes when a letter arrives with news that radically upsets an elderly couple’s life. From there, quiet images flow with a tight-fisted grace. Relatively minor turning points in scenes build impactful sequence climaxes until the story’s one and only act climax explodes in the film’s final image. 45 YEARS tells its tale inside the seldom-used genre of the Disillusionment Plot. Other examples: CAPOTE (2005), INSIDE LLEWYN DAVIS (2013), THE IMITATION GAME (2014). The Disillusionment Plot is the dark mirror of the Education Plot. Both genres pivot around the value of meaninglessness / meaningfulness but in opposite directions. The Education Plot moves from negative (meaninglessness) to positive (meaningfulness) as the protagonist begins the telling in a state of emptiness or despair, living a life of lost purpose. From there he undergoes an “education,” experiences that imbue his existence with meaning and lifts his vision of the future to the positive. Three examples: ABOUT SCHMIDT (2002), LOST IN TRANSLATION (2003), and BIRDMAN (2014). The Disillusionment Plot reverses this design. 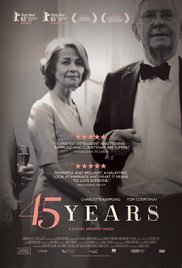 In 45 YEARS, Kate Mercer (Charlotte Rampling) lives, she believes, a fully meaningful life, devoted to her husband, Geoff (Tom Courtenay). His love for her and hers for him gives her life its only purpose. Then she discovers the truth: Geoff’s first love, Katya, who died 50 years ago, has always been his only true, unchanging, and secret love. Kate, therefore, has always been second best (if that) in Geoff’s life. Her husband (a rather shallow man, truth be told) has faked his feelings over the 45 years of their marriage. Therefore, the one thing that gave her life meaning was never real. 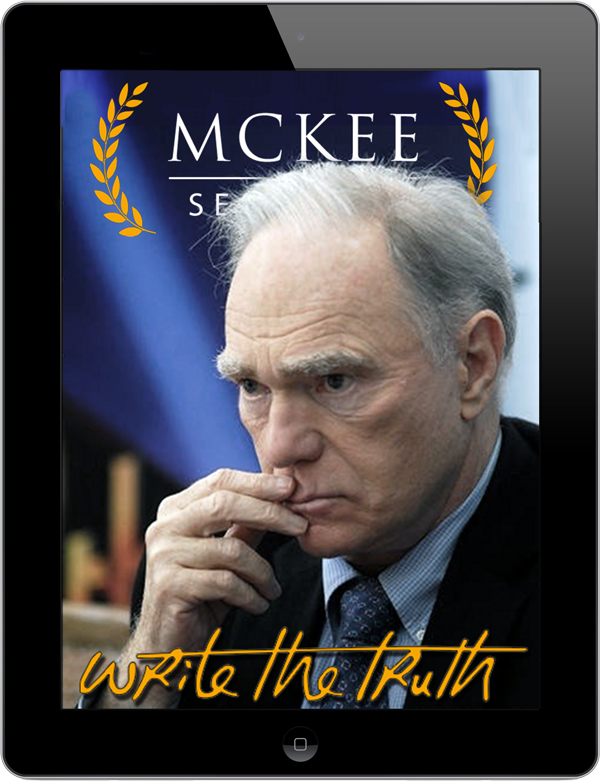 What greater humiliation could a person suffer than to discover that her existence has been rooted in a lie her lover told her on day one and a truth he hid from her for 45 years? None. This explains why the film’s one and only act delivers the emotional power of four Ibsenian acts: It is the final movement of a 45-year set-up. Storytelling minimalism uses minimum text to compress maximum subtext. Subtext, by definition, cannot be written out, and so the bulk of conflict and dramatic action happens unseen, within the characters, below the level of speech. All a minimalist screenwriter can do is leave room under the text and hope the actors bring the unsaid and unsayable to life. And the two stars of 45 YEARS did so with breathtaking force. In scene after scene, Charlotte Rampling and Tom Courtenay held the camera while they silently carved tragic poems, line by line, into their souls. As we sit watching, minimalism severely tests our empathy, concentration, and indeed, our humanity. Stories like this ask us to actively involve ourselves in the inner lives of characters that outwardly say or do very little. We have to imagine their complex and often subconscious struggles beneath images as simple as a woman head down in thought, walking her dog—images often long held on screen to give us time for absorption. No words of dialogue or narration to explain or confirm our feelings and interpretations. Like the characters, we are on our own. 45 YEARS demands all that and more. The audience must not only read inner lives and empathize but follow the tale’s descending emotional arc to its final implosion in angry, bitter disillusionment. Needless to say, most people will not or cannot make the effort. That’s why the audiences for minimalism are usually minimal.